UBC Library has undertaken a series of stakeholder surveys and consultations to update our strategic plan. These have resulted in the UBC Library Strategic Plan (2015 – 2017). The Library’s plan is informed by Place and Promise: The UBC Plan and by the needs and views of the diverse communities we serve. We invite you to explore the Goals and Key Actions of our plan through each of the five strategic directions. 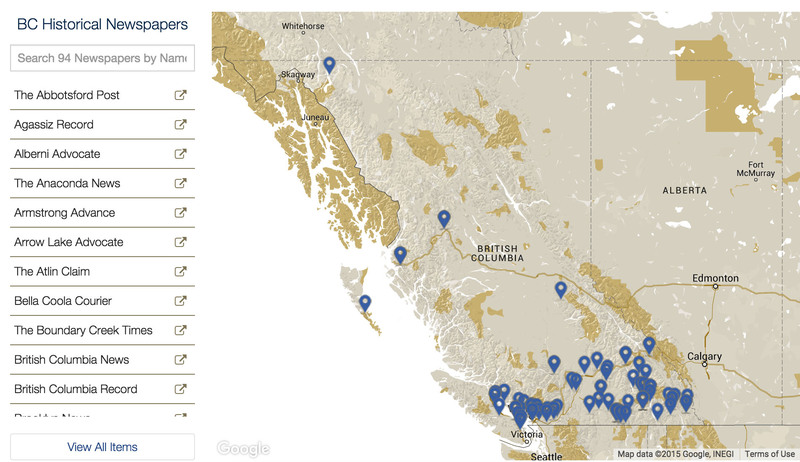 To see the map for yourself or check on anything you see in this post- just click the pictures! B.C. 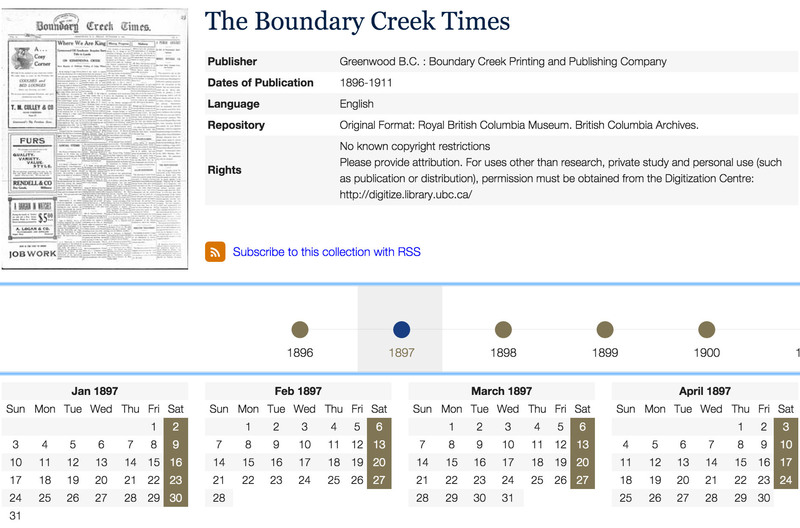 Historical Newspapers collection is a priceless resource for anyone interested in the history of British Columbia. In fact it is one of our most well used, well-loved collections!The [current] selection of 94 papers [and growing!] and 30,000 items reflects the social and culture life of the communities they were published in, making them invaluable to researchers, historians and curious folk alike. A resource, with the introduction of Open Collections, that just got even better! 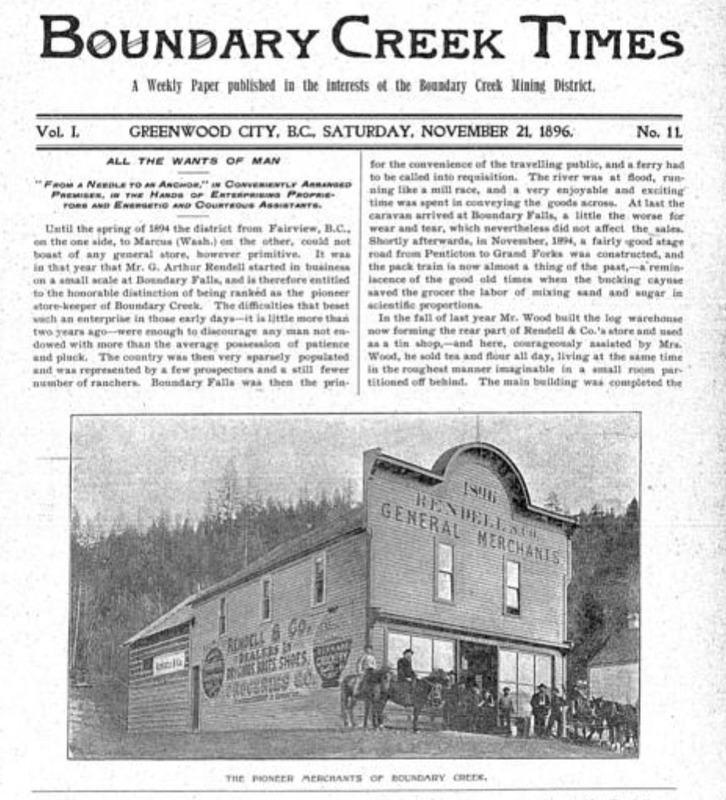 The papers come from all around the province with titles ranging from the Abbotsford Post to Westward Ho! The dates span over a hundred years, from 1865 to 1989. With Open Collections you can now browse through the papers by text, date, creator, through a listed scrolling bar, or even, most visually stunning, by map. Many collections display the publisher and the published dates as you browse. Clicking on a collection will take you to its personalized page where you can browse by date with a scrolling year bar. Dates the paper was published are highlighted in brown. Clicking on a date will take you to that paper- where you are free to scroll, zoom and download! My favorite Boundary Creek page- not only does it have “all the wants of man”, but it’s got a vintage picture of what’s likely every miner living in Boundary Creek in 1896. This collection is one that we are continually making better. Many of the papers are being updated so that you can have the best information possible, so keep checking back to see what new things you can find!